Help support the good work of the KVIS! Every KVIS member is a volunteer, working to help make the Village the best place it can possibly be. It has been said that it’s difficult to give of one’s self without getting something back in return. That statement is true for KVIS members—we receive the gift of a better community now for ourselves and the knowledge that what we’re doing is a both a gift to future generations and a part of our personal legacy of giving. You’re welcome to support the good work of the KVIS in ways that are best for you at this point in your life. Please take a look at our Committee page and see which of these small focus groups may interest you or perhaps you’ll consider a KVIS leadership position as an Event or Committee Coordinator. Maybe you're able to make phone calls or deliver our newspaper, help plan our work, or offer to assist at an upcoming event; your efforts and willingness to help is greatly needed and appreciated! The KVIS relies on the generosity of those who support our mission to help accomplish our goals. 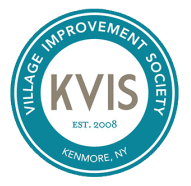 If you would like to donate a monetary gift you may do so with confidence knowing that KVIS funds are used right here in the Village of Kenmore. The KVIS is a 501(c) (3) charitable organization as recognized by the USIRS. ​If you would like more information on giving options, or would like to develop a giving plan that is right for you, please call 716-877-0477 or e-mail KVIS. Thank you!